Nissan Almera is not a new name and one thing which makes it memorable even with one look is its sleek and stylish exterior. With looks of a premium sedan, this gracious drive has got loads of chrome at the front radiator grille that make a stunning fascia with stylish boomerang headlights. The aerodynamic design of this sedan not only adds more to its aesthetics but also makes it a better performer with noiseless drives and improved fuel efficiency. The sleek structure is further enhanced by 4425 mm x 1695 mm x 1505 mm (L X W X H) along with 2600 mm of wheelbase. The exterior of base variant, 1.2 MT, is complemented by 14-inch steel wheels with 185/70 R14 tires while all the other trims are appointed with 15-inch alloys along with 185/65 R15 rubbers wrapped over them. While traveling in a car, you expect it to be comfortable and convenient and if the same is wrapped with elegance and a class-above, that's like the cherry on the cake. Well, Nissan has ensured that you get the best possible in features available in this segment and so it has added a wide array of aspects which you would hardly find in any other sedan of this class. The greige color scheme of the interior is further enhanced with a piano black finish along with silver accents on the sides of the center console which makes this cabin look absolutely premium. The dash is decorated with all the necessary gauges and gadgets to make the drivings convenient without giving a messy look. You get power windows, manual air conditioning facility, and manual sliding and reclining front seats. Talking about the cabin space, the 2600 mm of wheelbase is pretty good for a drive, which is meant for 5 passengers. The standard boot of this sedan counts to 490 litres which is something you would not find in every other sedan available in this segment. Also, there are various cabin compartments to stuff your handy things. For Filipinos, Nissan Almera is offered in 1.2-litre and 1.5-litre engine options and the company proudly claims both to be highly efficient. The 1.2-litre engine knocks out a peak power output measuring 79 PS at 6000 rpm along with a peak torque counting to 106 Nm at 4400 rpm while the bigger sibling, the 1.5-litre power unit, churns out 99 PS of maximum power and 134 Nm of maximum torque. The 5-speed manual transmission is offered with both the engines while the 4-speed automatic gearbox is restricted only to the 1.5-litre engine. The fuel consumption of this big engine falls between 13.8 to 16.0 kmpl in standard conditions which is quite decent. Also, the new Almera is engineered for quick response to the steering input and to take the bumps on stride. As far as ride & handling are concerned, you can expect outstanding agility from McPherson struts with coil springs and stabilizer bar front suspension along with a high-response damper which is usually found in high-end luxury sedans. So, you would hardly feel the roughness of an uneven driveway. Japanese consider safety as an essential feature and not just an optional aspect. 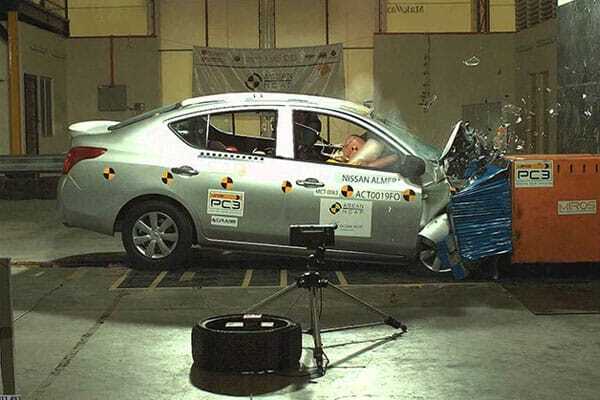 Keeping the same in its mind, Nissan has packed the new Nissan Almera with numerous safety and security aspects which can give you peace of mind. There are SRS airbags for driver and front seat passenger to protect you in the case of a collision. Other safety aspects in the package include Anti-Lock Braking System (ABS), Brake Assist (BA) and Electronic Brake-Force Distribution (EBD) to ensure stability and absolute control even on slippery and uneven driveways. The protection is further enhanced by rear parking sensors (3 Eye) which give the comfort of convenient parking even in tight spots. Also, there is keyless system and trunk remote with a panic button. While some of these features are optional or not available on the base trims, the speed sensing door locks and high mount stop lamp are given as standard features in all the new Nissan Almera variants. 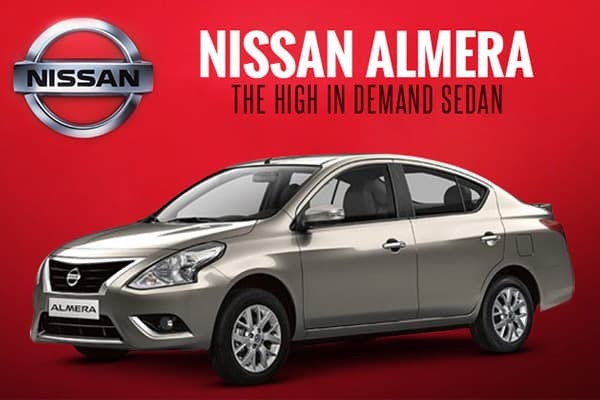 If you are looking for a sedan under PHP 700,000 then, Nissan Almera should be included in your options list.